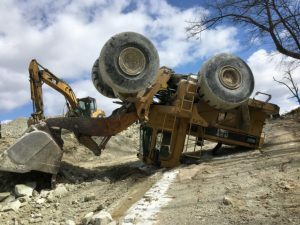 While building an embankment to circumvent any material from a water supply, a front end loader operator experienced a close call. On March 13, 2018, the operator backed his front end loader over the top of a roadway berm; the loader and operator slipped down the embankment; and the loader landed turning over onto its roof. Fortunately, the operator was wearing his seat belt. He unfastened the seat belt and escaped the upside-down machine through the broken right-side window of the loader door. Front end loaders are often involved in accidents due to a shift in the machine’s center of gravity. The U.S. Department of Labor Mine Safety and Health Administration (MSHA) documented this incident and issued the statement and best practices below for operating front end loaders. • Load the bucket evenly and avoid overloading (refer to the load limits in the operating manual). Keep the bucket low when operating on hills. • Construct berms or other restraints of adequate height and strength to prevent overtravel and warn operators of hazardous areas. • Ensure that objects inside of the cab are secured so they don’t become airborne during an accident. • ALWAYS wear your seatbelt. • Check the manufacturer’s recommendations and supplement appropriate wheel ballast or counterweight. • Employ maximum stabilizing factors, such as moving the wheels to the widest setting. • Ensure everyone within range of the loader location is a safe distance away. • Operate the loader with its load as close to the ground as possible. Should the rear of the tractor tip, its bucket will hit the ground before the tractor tips. Use the TapRooT® System to put safety first and to solve problems. Attend one of our courses. We offer a basic 2-Day Course and an advanced 5-Day Course. You may also contact us about having a course at your site.